Enactive Co-presence in Narrative Virtual Reality: A Triadic Interaction Model is a research project which combines arts and sciences to explore how the viewer’s experience of co-presence can be controlled by parametrically modifying the behavior of a screen character or its context. It is led by research professor Pia Tikka, Baltic Film, Media, Arts and Communication School (BFM) & Centre of Excellence in Media Innovation and Digital Culture (MEDIT), Tallinn University. Film narrative can evoke strong emotional identification with the screen character in a contextualized situation. Imagine a mother, who has been compelled to make the decision on which of her two children she will send to an inevitable death (Sophie’s Choice 1982). Then imagine her stepping out of the fixed narrative frame and establishing an eye-contact with you, the viewer, in a face-to-face setting. This is what I call the experience of co-presence, a contextually primed shared experience in which mutual communication is meaningful beyond words. The future cinema in immersive virtual reality (VR) allows real-time interaction between the viewer and screen characters, thus expanding the potential of cinematic narratives and their design to new dimensions. This research project looks for answers to the question, what experiential aspects these new methods of storytelling may add to the viewer’s experience of co-presence, and how they can be harnessed for storytelling in VR. The core assumption is that new technological developments such as VR do not radically change the way how stories are told. Rather, same emotive-cognitive rules that drive narrative sense-making in literature and films , drive our minds also when exploring narratives in VR headsets. In this sense, the proposed project differs from those voices that call for completely new rules for creating stories in VR. Instead this project relies on projecting established narrative conventions to the new immersive platforms . After all, it is stories one wants to engage with, not the technology itself. Yet, some new features are introduced by VR, namely, the experience of co-presence with the screen characters in the narrative world. In accordance with the phenomenological inquiry to human embodiment and situatedness [31,34,52], the theory of enactive mind [55,56], and the biocultural paradigm of film studies [15,46], the project assumes that socio-cultural dynamics shaping human experience cannot be separated from the biological body-brain system. Here, the key attribute of ‘enactive’ [45…50] coined by Francisco Varela and colleagues in 1991 refers to a human agent that is continuously monitoring other people’s intentions based on one’s previous experience (theory of mind)  and by means of unconscious imitation of other’s actions [5,13,19]. Indeed, eye-contact is a powerful tool for manipulating social interaction in context . 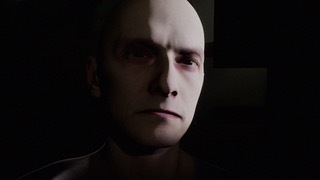 Expectedly, studies show that direct eye-gaze of an virtual character elicits stronger psychophysiological responses in viewers than averted gaze [38, 39]. Based on the recent neuroscientific and psychological findings narrative experiences are assumed to a great extent shared intersubjectively across different viewers. [3,16,17,22,24,25,29,30,37,40,51,53]. 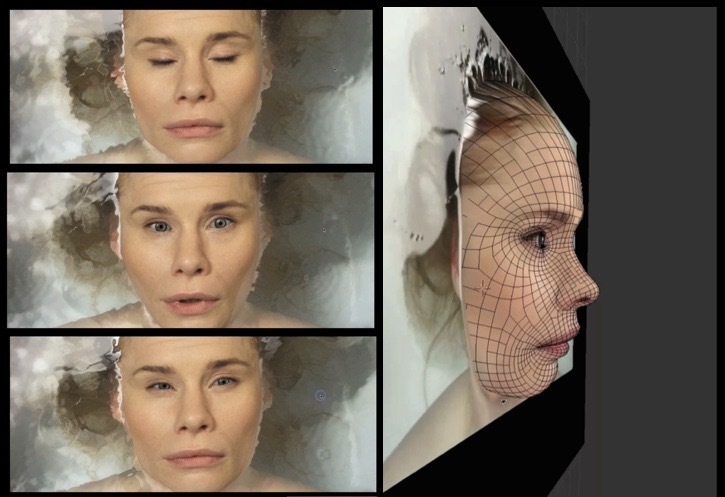 Here, the context matters: studies replicating the classic Kuleshov’s experiment from 1910 confirm that the valence of the context not only predicts the viewer’s physiological state, but also her interpretation of the film character’s emotional state [2,28,35]. 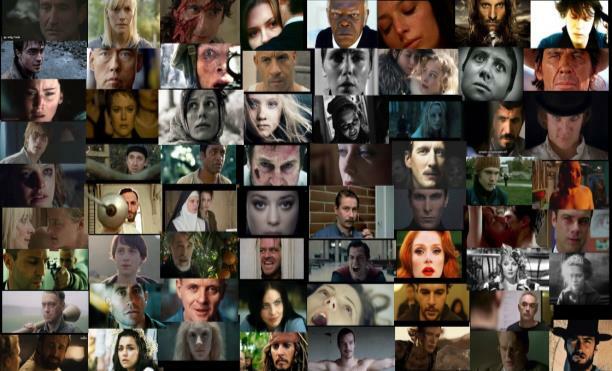 Image: These isolated faces of a selection of screenshots allow a vague interpretation of each character’s related emotional states. However, as argued by the proposed project, although some narratives appear familiar, an immersive emotional engagement, here referred to an experience of co-presence, requires dynamical living-by particular contextual situatedness of each character. The viewer experience of co-presence with the screen character in contextually immersive situations such as in VR is still relatively sparsely studied. For the proposed project, following Tikka and colleagues [14,23,41,49,50,57], a narratively contextualized enactive screen character is adopted as an instrument to explore how the viewer’s experience of co-presence can be controlled by modifying parametrically the behavior of screen character or its context [6,27]. The setting serves as to describe the dynamical interrelation between the psychophysiological, experiential, and contextual variables that produce a particular sense of co-presence reported by the viewer.